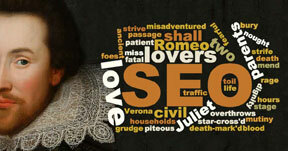 If Shakespeare had a website and wanted people to find his works he, like all of us online business-people would have to understand Search Engine Optimisation (SEO). At the heart of being found online is ‘Keyword research’ which is a catchall term for the activities you undertake to create a good list of words and phrases you would like to rank for, towards the top of a search engine results page. Another term commonly seen online is ‘Keyword strategy’ which comprises all the website change decisions you make on the basis of your keyword research. Keyword research is the basis of all search marketing including native search results from what people enter into a webpage search box or text used as part of a paid advertising campaign (Bing Ads, Google Adwords etc). It all starts with outlining what your business does or sells in the language that your potential customers use. Methinks using fancy outdated language from Shakespeare’s days may perchance not always return the search results needed for a business of today. Keyword research helps you find out what you should be ranking for, or at least intend to rank for. The importance of keyword research. Effective keyword research will make clear what search terms are used by your customers/site visitors / audience. I often find clients have a specific set of words they use when referencing their services and products. However their customers are not always in on the game and use a different set of words and phrases. Optimising for words and phrases that real site visitors never use is bad for business. You need to change for them. Completing effective keyword research ensures that you use the words your target audience uses, and therefore completes the circle of optimising your website and delivers more site visitors. Once you have them make sure your site goals are clear (read more about conversions). How do your potential customers search? What terms will they use? What problem are they wanting to solve via your website? Try creating a list of all search terms site visitors could use and come up with combinations and alternatives within those search terms. What’s the difference between Keywords and Keyphrases? The two terms are interchangeable. A keyword can actually be two (or more) words such as ‘slings and arrows’ or ‘outrageous fortune’. It’s crucial to make sure that keywords fit your business website. Understand that you only need to be found by people actually looking for the service or product you offer. Being found and ranking #1 for ‘slings and arrows’ when you sell baby food will be of no benefit to you or the searcher. This could lead to your site registering a high ‘bounce rate’ which will impact your future ranking as the search engines penalise sites for inappropriate keyword usage. Keyword research is an activity that needs to repeated and refined regularly. You are running a business so you need to balance time and effort against physical business activities and decide the best intervals for keyword research. If you don’t have time or the right skill set to DIY there are outsourcing options you could choose. Be ready to answer questions and provide information about your business and your competitors if you decide to seek help. If your business changes or you add (or remove) products and services it should be a trigger for a keyword research review. DIY Keyword research tools from Google. Google Adwords Keyword Planner – to find new and related keywords. Unfortunately the search volume data is not available for Australia, which makes it unhelpful for keyword decisions, but it’s still a useful tool idea generation. Google Trends – allows you to compare the traffic for sets of keywords. You can even see the difference for many geographical regions but again the low Australian search volumes limits the effectiveness. It’s useful to check Google Trends if you expect that some of your keywords are seasonal. These keyword research tools should enable you to create a list of search terms relevant to your business. You should make sure to create awesome landing pages for keywords you want to be found on and make sure you update heading tags and content on your site’s pages. Don’t just limit the changes to your home page. We undertake keyword analysis and optimisation using professional tools for customers on our Essentials and Professional plans but are happy to undertake a review of any site to give advice on how to attract more relevant traffic. generate leads and accelerate sales online.